It’s hard to believe that 2014 is almost over. It’s been such an amazing year for real estate. This year I’ve been able to help many people buy a home in Santa Barbara, and I feel blessed to live and work in beautiful Santa Barbara, CA. With 2015 quickly approaching, your list of New Year’s resolutions might include a big change that involves looking at luxury houses for sale in Santa Barbara. The housing market is very active right now, which makes it the ideal time for you to consider a Santa Barbara relocation. Moving to a new home is a big step and it takes plenty of due diligence. It’s something that should be given adequate time and attention, and you should do your best to make sure that you have a reputable Santa Barbara real estate agent on your side. As you start to look for a new home for 2015, here are 4 questions that you should ask yourself. As you answer them, you’ll be able to have a better idea of what you are looking for as you search to buy a home in Santa Barbara. One of the first questions that you’ll likely want to ask yourself is where exactly you want to live. Do you prefer beachfront property or something that is a few blocks in from the water? Do you want to be in a trendy up-and-coming area or somewhere that is more traditional and family-oriented? There are a variety of different options that you can consider when looking at Montecito homes for sale, so narrowing down your choices by location will help you get off on the right foot. 2. Who Else Is Moving? If you are a single bachelor that is looking to make the move, then you won’t have to worry about accommodating to the needs of others. However, if you are a family, then you are likely going to have many more considerations to make. For example, if you have children, then you’ll want to ensure that you live in an area with good school districts. For your ownpersonal satisfaction, it may also help if you buy a new home in an area that is easy for you to get to work. The more people that are moving, the more considerations that will need to be made to find the perfect location for everyone. 3. What Is The Status Of The Current Market? As mentioned before, the housing market continues to rise across the nation. Specifically, the housing market in Santa Barbara and Montecito is especially popular. This is because Santa Barbara and Montecito remain destinations for those looking for vacation homes in a beautiful city. Your home should be an investment that you consider with long-term value. Therefore, buying when the market is hot will help you get more from your purchase. 4. Do You Have The Help That You Need? One of the best home buying tips that you can have is to not go at it alone. You have a job, family, and other personal commitments that you have to stick to. Therefore, looking for a home can feel impossible. Luckily, if you know how to find a good Santa Barbara real estate agent, then you can have help when you need it most. Not only will a real estate agent be able to find you the home of your dreams, but they’ll also be able to help you with paperwork and other steps during the process. While a real estate agent may be an added cost in the process of buying a home, it’s one that is well worth it if it’ll save you thousands in the long run. I’d like to take the time to wish everyone a merry holiday season and a safe New Year. Q: Can a realtor help with selling a home? A: Not only can a realtor help you find a new home, but they can also assist you with selling your current house as well. With house staging tips, real estate agents know how to set up your home in a way that will make it appealing to new buyers. Q: What fees are associated with hiring a real estate specialist? A: Each real estate agent will have their own guidelines for personal fees. However, you can typically expect to pay a commission based off the selling price of the home, as well as other fees in the process. It’s best to contact your real estate agent to learn more about their fees during the process. Q: Is now a good time to sell my home? A: Not only is the market in prime shape for purchasing homes, but it is also a great time to sell as well. If your home took a bit of a dip in value in recent years, it might be time for you to get a reevaluation. Whether you are new to Santa Barbara or you’ve been here for years, you’ll soon realize that the holidays are a great time to get involved in activities with your family. Here is a look at some of our favorite events to close out 2014. Casa Dolores: Mexican Objects from the Permanent Collection – Come to the Casa Dolores building to see Mexican Objects From The Permanent Collection. You’ll see a variety of different works that you’ll be sure to enjoy. Art to Zoo: Animals in Art – If you are looking for something great for your kids to do during their time off from school, be sure to check out the Art To Zoo: Animals In Art exhibit at the Santa Barbara Museum Of Art. Your children will be able to paint, draw, sculpt, and print amazing artwork of their favorite animals. The event is held Wednesdays in December. Cachuma Lake Eagle Cruises – End the year right with one of these romantic cruises. It’s only two hours, so you and your significant other can still be in home to tuck the kids in for bed. This event is on December 28th, with multiple different times slots to choose from. Santa Barbara Holiday Wine Tours: Santa Barbara and Santa Ynez are home to some of the best wineries. Consider one of the Holiday wine tour packages offered by Sammy’s Limousines and Tours. They have knowledgeable wine tour guides and will take you on a private tour to the vineyards of your choice. Blush Restaurant + Lounge: Christmas Dinner, December 24 & 25. Let Blush do all the cooking for Christmas this year. They will be open Christmas Day from noon until 10:00 p.m. Chef Brandon Worrell and his staff will create an amazing combination of California cuisine and traditional favorites for your holiday dining pleasure. About Barbara Reaume – Barbara Reaume is a professional Santa Barbara realtor for Coldwell Banker, with over thirty years of experience. As one of Montecito’s top realtors, people who want to sell orbuy a home in Santa Barbara seek out her advice on buying a single family home, finding a condo, or purchasing land as an investment. Visit the websiteand Facebook page or call 805-610-5403 for more information or to request a quick quote. Holiday season brings about a happy feeling, and people tend to become more giving and generous. Those who are planning to get a new home during this season should not be carried away with those feelings by thoroughly checking the properties before sealing the deal. The tips and other information mentioned above are very useful. 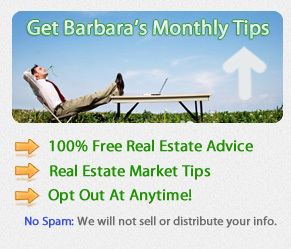 Considering Barbara as one of the best Realtors in town, this article is indeed very valuable for me. Those are absolutely awsomee…particularly love the purple one. I was actually thinking of getting a patio umbrella as a gift for a friend of mine…here’s hoping these aren’t too obnoxiously expensive!